Click Add CTI Link and select Genesys. ​Configure the CTI link by entering information in the following form. Auto Start – Select this check box to have Pega 7 start the CTI engine when Pega 7 starts. Allowing Pega 7 to autostart a CTI link ensures that the link is ready when a CSR needs to use telephony services. If Auto Start is not selected, the first CSR to log in after Pega 7 starts is likely to experience a longer delay before being able to log in. T-Server Host Name – Required. Enter the host name or IP address of the T-Server. Tenant ID – Enter the user ID for the CTI user or connection on the CTI Server. 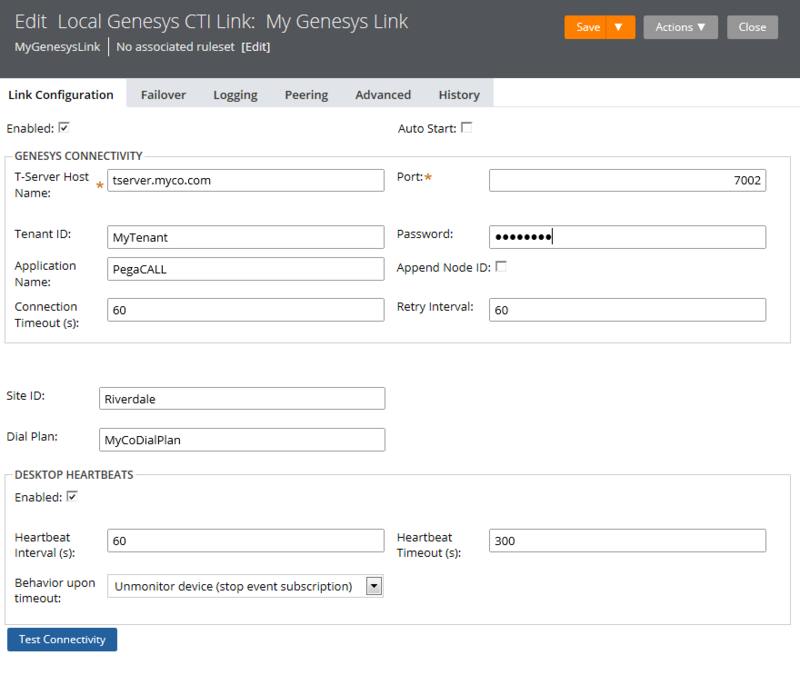 Application Name – Enter the application name that is associated with PegaCALL on the Genesys CIM platform. Append Node ID – Select this check box to append the Pega 7 node ID to the application name. In a Pega 7 cluster, this enables identification of each Pega 7 node connection to the T-Server. Connection Timeout(s) – Enter the time in seconds before a CTI link is considered to be disconnected. The CTI Link Engine waits for this duration after a connection interruption before attempting to connect to a backup CTI Server (if one is configured). Retry Interval – Enter the time in seconds between attempts to reconnect to the CTI Server. Set the Retry Interval to a lower value than the Connection Timeout to allow the CTI Link Engine to attempt to reconnect to a CTI Server before attempting to fail over to the backup CTI Server. Dial Plan – Select a dial plan rule to use to place calls with the CTI Link Engine. If no dial plan is selected, dial strings are sent to the PBX/ACD without modification. Desktop Heartbeats Enabled – Select this check box to require heartbeats from desktops. If a PegaCALL-enabled desktop stops sending heartbeat messages (such as when a web browser is shut down without properly logging out from CTI), the CTI link stops monitoring the device (phone or extension) associated with that desktop. Desktop Heartbeats Timeouts – Enter the elapsed time (in seconds) after which, if no heartbeats have been received from a desktop, the CTI Link stops monitoring the device associated with the desktop. Set this timeout to an interval that is several times greater than the heartbeat interval.